The Bartlett Rock Art site is located northwest of Moab, Utah off of the Dubinky Well Road. 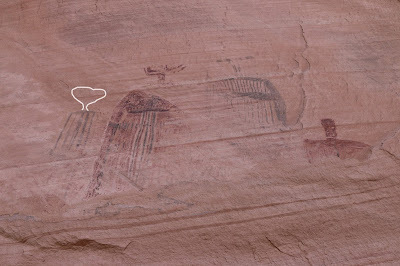 The site boasts a number of Barrier Canyon Style pictographs that have been referenced on History Channels Ancient Aliens TV show. 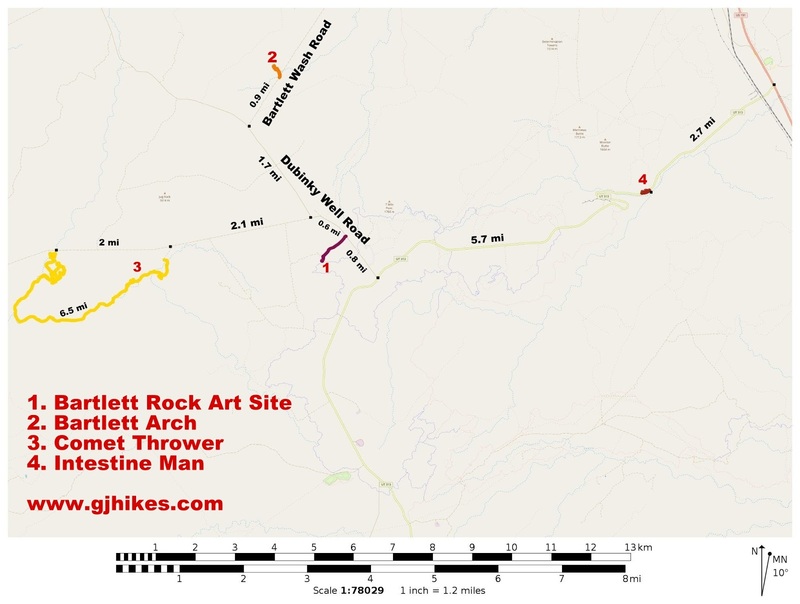 Close proximity to a paved road along with a relatively easy short trail to hike make the Bartlett Rock Art site a suitable activity for families with small children. To get to the trailhead drive north out of Moab for about 9 miles on Highway 191 and turn west onto Highway 313 towards Dead Horse Point State Park and Canyonlands National Park. Continue along Highway 313 for about 8.4 miles and turn right at the sign for the Lone Mesa Campground. This is the Dubinky Well road although there is no sign that mentions it. There is a restroom at the View Area on the east side of the road right before reaching the turnoff. Follow the graveled Dubinky Well road as it drops down a small hill for about 0.8 miles to where a dirt road branches off on the left. It is a half mile down the dirt road to the trailhead. A careful driver in a passenger car might be able to make it under good conditions. There are a couple of rough spots on the road and the area around the trailhead is a bit rough also. Vehicles with low clearance might want to park before reaching the trailhead. For those that choose to park all the way out by the Dubinky Well Road the round trip distance to the alcove with the pictographs will be about 1.2 miles. The trail has been rerouted so that most of it now makes use of slickrock to get to the alcove. Please support the reclamation effort by following the cairned route across the slickrock. Although there are several alcoves in the area all of the pictographs can be found grouped together in one panel. While most Barrier Canyon style images look like aliens there are those like this one that look especially 'out of this world'. The image on the left looks headless until you get a closer look. The white paint on the panel has faded much more than some of the other colors. The red image on the right looks a little like 'Iron Man' or the 'Big Friendly Giant'. The two in the middle are a bit reminiscent of Hopi Kachinas. None of the alcoves look like they have ever had structures built in them. Maybe it was just a pretty place to get together for a special ceremony or something. There is a rock nearby that has a sharpening groove worn into it as well as a smooth grinding surface. While visiting the site be careful not to do anything that might damage it. Be sure not to touch the images. It is also illegal to dig around an archeological site or to disturb it in any way. As you can see from the photos the lower part of the images have already peeled away from the cliff making whatever was painted there unrecoverable. Sites like this must have been like big billboard signs when they were freshly painted. 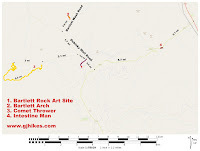 For those that are interested in ancient rock art and happen to be in the Moab area the Bartlett Rock Art site is a good option to put on your list. If you would like to see it for yourself then all you have to do is 'Take a hike'.